These percentages only account for 56-67% of total groundwater recharge, 17% of which is stream autogenic recharge. Autogenic recharge means a concentrated flow into large fractures, caves and sinkholes. Upland autogenic recharge accounts for 33-44%. According to prior tests, upland autogenic recharge only accounted for 15% of recharge. 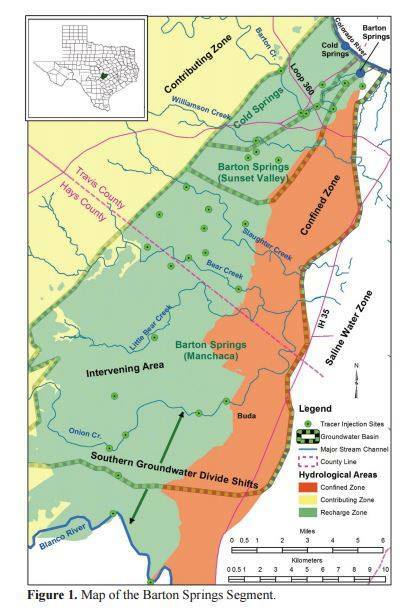 This means that water flowing directly from karst land in the recharge zones is playing a far bigger role in the recharge of Edwards Aquifer than expected. The karst landscape is largely composed of hole-ridden limestone rock that allow water to easily percolate through the terrain and into the aquifer. Precipitation that falls on the recharge zone flows directly into the aquifer. This study illustrates the importance of proper environmental practices even when the area isn’t directly next to a water body.